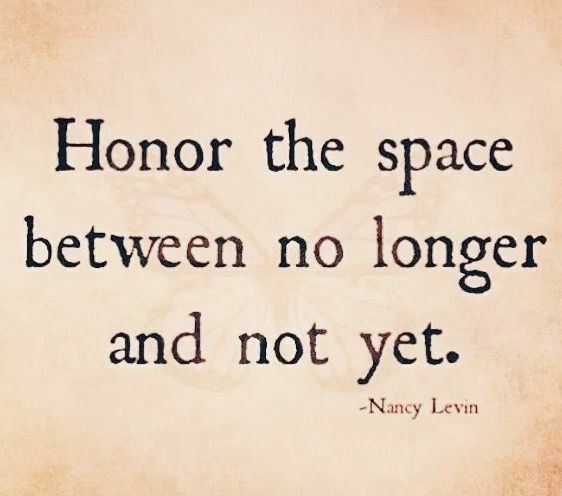 The last six months have been about the space between the “no longer” and the “not yet” for me. Have I honored that space? Not hardly. I screwed a lot of things up. Perhaps I handled it as best as I could have expected to handle it, without ignoring what I was going through completely. I could have compartmentalized it, moved on without grieving and just pulled myself up by my boot straps and plowed forward. I think I fell somewhere in between honoring it and ignoring it. I was very aware of the place, and I tried on some level to grieve. The hard part for me was that life still had to go on, and things still happened around me. And I was not in any kind of emotional place to deal with them well. I sought counseling from a few places and people. I tried to be aware of my emotions and my pain without trying to give them more attention then they needed. The last thing I wanted was to become a martyr. The counseling helped… but time ultimately was the most effective thing in helping me through the grief. There were a lot of layers to my emotions and what I went through. And as life continued to happen around me, more layers were added. I didn’t deal with things as myself, because I simply wasn’t myself. I was a new version of myself, almost a hollow version of who I had become, beaten down by so many things that caused me pain. One day in the car, I was feeling particularly overwhelmed by everything I had to deal with and I remember having this image of me sitting on a chair in the middle of a tornado. I felt like everything was happening around me, and everything was happening to me. I was not in control of a single thing – things were just happening to me. It was all I could do to merely react to this tornado, rather than act with any kind of intentionality. And that’s what it was like. For months, all I did was react. There was an overwhelming amount of change in my life – and only about two things in my life were stable. When your life is in an uproar like this, acting doesn’t feel possible. For me, reacting was all I was emotionally capable of. As things ended: a job, a home, a friendship… as those thing become the “no longer” in my life, I am still looking ahead to what is “not yet,” hoping it will be better than what no longer is. Because honestly, going through all of that was really awful. It was a lot of loss that I had to go through alone. I am moving on to another season in my life. I am looking forward to this one, and may I be ever mindful of the space between where I just was and what is to come. It's hard, but always worth it. Thanks for reading.